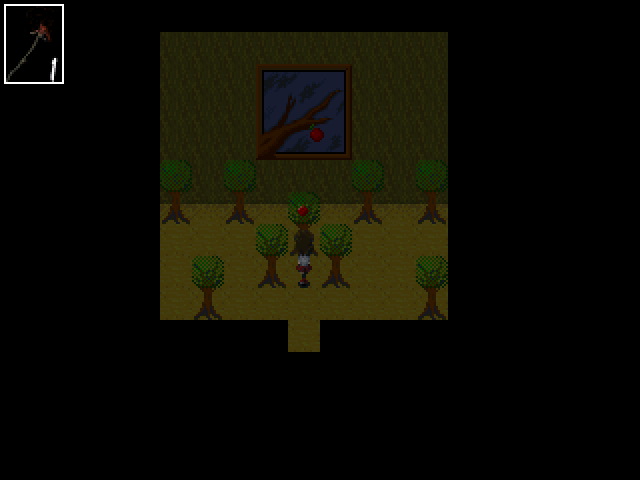 Ib is a game about a young girl who goes to an art exhibition with her parents. The exhibition is a retrospective on an artist named Guertena, whose work can best be described as a mashup of contemporary art, running the gamut of painting, sculpture, “outsider”-style modern art, and basically anything else you can think of. Ib wanders away from her parents and through the gallery, returning after she has viewed all the work in order to find that her parents have disappeared. Then she gets swallowed by the artwork. 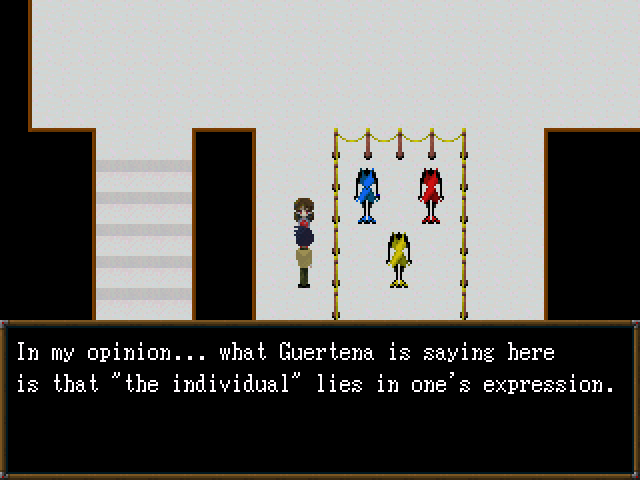 The rest of the game is spent moving through a dreamlike world based on Guertena’s art. The game moves along via narrative events and puzzles that facilitate the narrative, mostly in the classic adventure game model of “find something and take it to a place,” although this is occasionally interrupted by moving block puzzles. 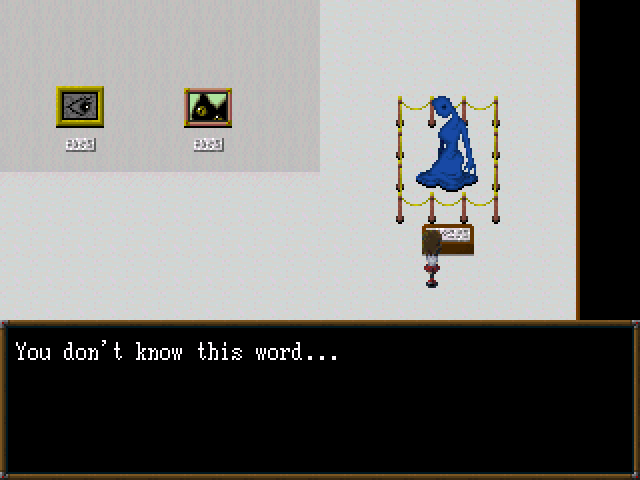 Ib is a horror game built in RPG Maker, which means that there are certain things afforded to the game. To begin with, it means that some general markers of contemporary indie horror games, like a first-person view and sound cues based on that, aren’t available to Ib. The effect of that, and this might a necessary simplification, is that Ib has to work a lot harder to be a scary game. 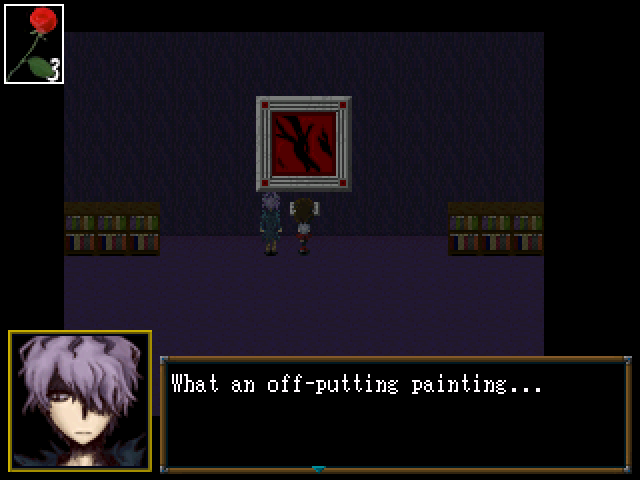 Being set in an art gallery enables Ib to be a horror game on face due to the nature of contemporary art. Walking through the post-1950s section of any major art institute in the United States is, with the right lighting and music, indistinguishable from a haunted house. Ib is designed to leverage this, with each piece of Guertena’s art from the opening of the game appearing variously as either moving, scary paintings or walking/shuffling enemies. The affordances of the RPG Maker platform are crucial to how the artwork of Ib is horrifying, particularly in the realm of motion and action. RPG Maker is not an engine that you would choose in order to make a game about aggressive action — rather, RPG Maker is better at methodical, narrative-oriented experiences. The art objects that you find scattered through the dream world of Ib are mostly static, staying in their tile space and animating at unpredictable times and intervals. In the case of the few enemies that actually move, we can see that they just sort of generally move in the cardinal directions toward the player, meandering in a semi-disinterested manner toward the player, attempting to eliminate her from this dreaming. 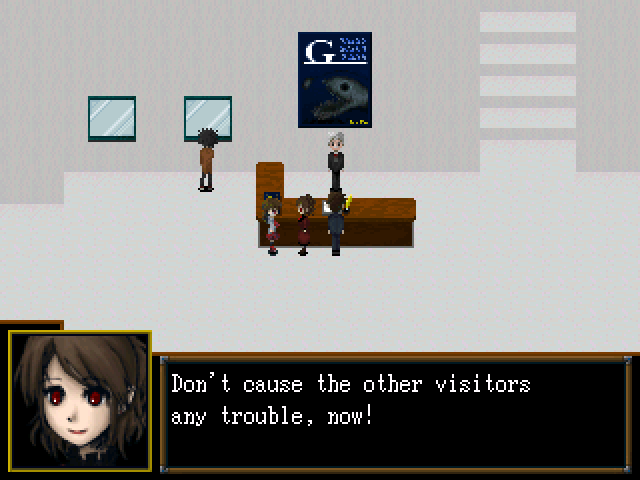 Why talking about the “how” of Ib‘s horror requires us to move beyond the level of the aesthetic, I really do want to stress how successful creator Kouri was in leveraging what was possible within the restrictions of RPG Maker, particularly in the design of horrific encounters. 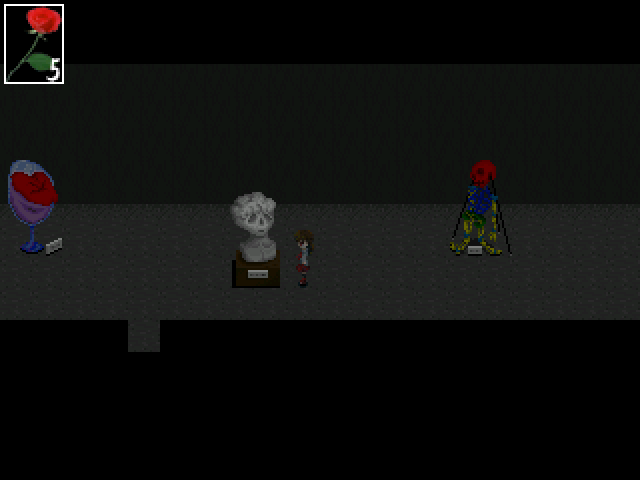 For example, in one segment of the game Ib’s companion Garry is being followed by a doll. The character moves up through a zig zagging pathway, moving right and left, and a doll constantly appears in front of you on the ground. Every time you move far enough away for it to disappear from the screen, it appears again in front of you. Each time that you see it anew, you can choose to talk with it; it will always be hurt and sad that you are abandoning it. This static placement of the sprite seems wholly disinterested in the player — there’s no obligation to interact with it. That makes it more effective when you do choose to speak with it. Kouri knows that the repeated appearance of the doll will interest us, and when we speak with it, we’re delivered the uncanny experience of it speaking directly to us, questioning why we would leave it behind us every time the screen scrolls to the right and the left. In another scene, Garry enters a small room filled with a number of dolls, and there’s a large empty picture from in the back of the room, directly in front of the player. The door locks and a timer starts, and the player has to find a special doll. While you’re hunting for the correct doll, a large, more horrifying doll slowly creeps up and through the empty picture frame. If it comes through, the game is over. This design move is one that I’ve seen occur a few times — off the top of my head, Deep Sleep and 5 Days a Stranger both used it to varying success — and it seems to be a very safe method for taking a game that generally has a creepy feeling and putting it over the line into adrenaline-fueled full-body sweating. Overall, I think it is a pretty successful design strategy — taking a very deliberate experience and inserting a quick moment of non-deliberative action interrupts the player’s expectations of what is coming. I apologize for some of that being dry (and maybe repetitive for frequent reader of this series), but I really do think that Ib is successful because it is leveraging a lot of qualities that I’ve been harping on in this series. It avoids jump scares in favor of a general creepy feeling that is delivered through repetition and the plodding, always-forward nature of the top-down JRPG aesthetic. Many of the games in this series leverage the unknown as a way of generating fear. As I’ve gone over time and time again, the most common way of addressing the unknown is through sensory denial, and even more specifically, by limiting the visual field the player has access to. Ib avoids this by leveraging tranformation instead of appearance; things that exist in the visual field turn into something horrifying in front of you rather than simply blinking into existence at an optimal scary moment. By choosing a contemporary art exhibition as the setting for the game, Kouri is also operating on the indeterminacy of that space. Guertena’s paintings can come to life at any moment, and it triggers a deep fear in me. 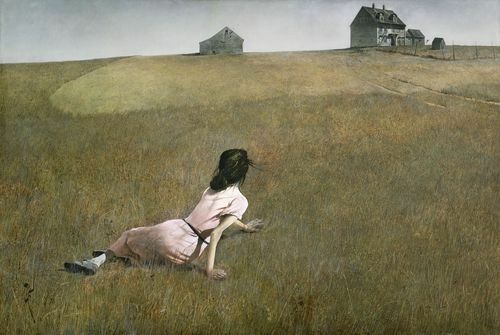 Could there be anything more terrifying than Christina’s World turning and looking back at the viewer? What if The Golden Calf woke from its sleep and spoke, holding us accountable for its death? These works operate on that uncanny level — what if they addressed up more strangely than they do now? — and Kouri takes it to the next step, literalizing that address, and affirming that there would be no love for us from our creations. I experienced a general discomfort during this game. I checked behind myself a few times. I thought I heard noises. Download Ib for free here. This entry was posted in Designing Horror, Video Games and tagged design, horror, ib, kouri, video games. Bookmark the permalink. I need to play this – been meaning to anyway. It’s a bit juvenile, which is what I think makes it interesting. What scares a teenager? In this case, it’s all your friends slowly turning against you or dying as you discover the terrible person that lives inside of you. Also, giant deadly vaginae make appearances, so that’s always nice. Oh this looks really neat, that’s for letting me know about it!